It all began with a cardboard tube. A giant cardboard tube, addressed to “Oscar Rubio”. At work I have a foible about people who use our hostel address for their mail. Over the years the bulk of mail has grown exponentially with long forgotten visitors. When this over-sized package arrived for someone not even checked in to the hostel, my wrath had been invoked before we had even met. Off duty, I was lounging at front desk chatting with staff when I met a beaming 20-something with easy charm. He said “I think you have a tube for me.” I was taken aback. “Oh. You’re Oscar of the tube.” I remarked merely hinting my previous irritation and more curious about this smiling traveller than angry at all. Oscar with some mystery, said he’d show us. Glowing with pride he released two science-fiction, purple coloured sticks from the tube. In turn I and the hostel staff lifted the shiny purple sticks that were indeed feather-light. So light in fact, it seemed pure fairy-magic that these items could exist taking the volume they did. I waved them around uncontrollably, seemingly unable to regulate my muscle to the evidence of my eyes. “And what are you off to do with these beauties?” I asked. A bold adventurer! I immediately forgave the postal faux pas, and decided this bright fellow was curious enough to be questioned. Offering beer on the porch I invited him to chat with me later that evening. Oscar is twenty five, originally from Mexico City and studied Economics in Chicago. His custom hiking trip is a montage of more famous trails glued together by other enthusiasts (or adventurers as Oscar prefers to name them) and his own research. 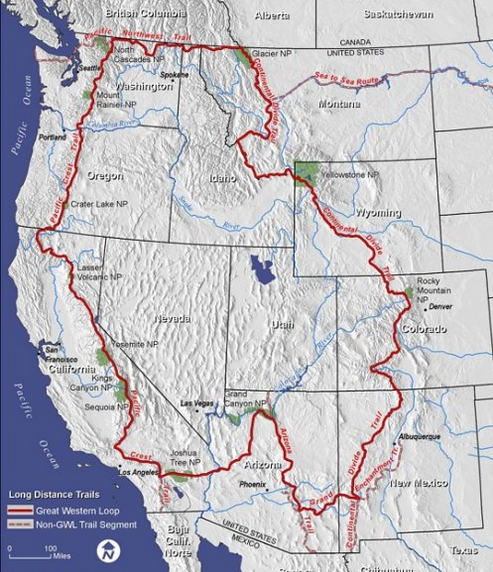 The Great Western Loop, as it has been called, connects established trails including the Pacific Crest Trail, the Pacific Northwest Trail, the Continental Divide Trail, the Grand Enchantment Trail, the Arizona Trail, and a section between the Arizona Trail and the Pacific Crest Trail across the Sonora and Mojave deserts. So how does a young, talented professional suddenly change tack and decide to do something completely different? 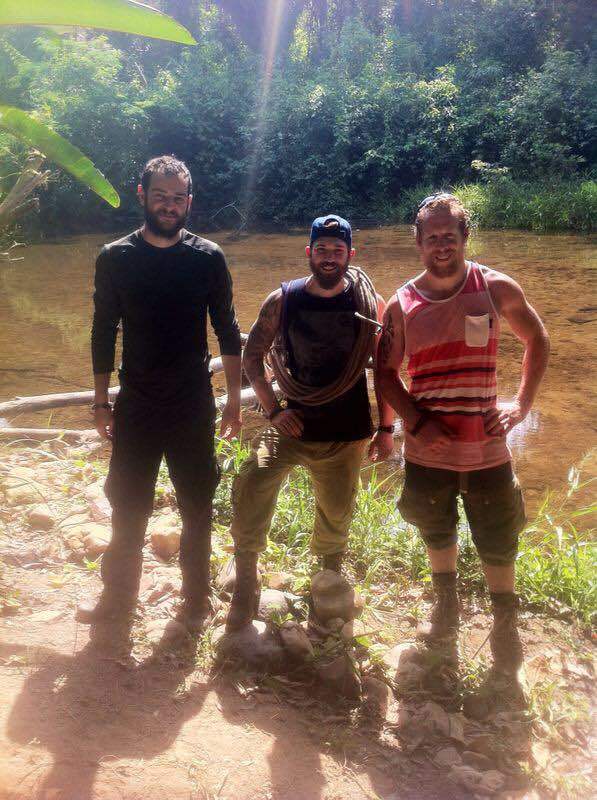 A pivotal event in his training was a trek to Victoria Peak in Belize. It was an optional hike, not part of the curriculum. The British army who had previously provided support for hikers had left, so if anything went wrong you’d be on your own. This trip was planned for three days, for a total of 26km each way. Day one would take them from kilometer zero (a hiker shorthand term I quietly assumed) to kilometer 19, the next day kilometer 19 to the summit and back, and the third day from km19 to km0 again. Oscar and friends Dan and Adam began the trip began a little later than planned. When they arrived early on at a camp situated at km12, Dan suggested “Maybe if we leave our stuff here, we’ll be able to get to the peak, since we can’t sleep without our stuff.” The group knew some other people had made the trip in two days, so they weren’t worried. Oscar added “Km0 to km12 was so easy we figured we could do it.” They merrily repacked, leaving the majority of their food and their camping equipment, and set off. Things changed from km12 to km19 when the terrain became a great deal tougher. Oscar called it “insane”. “It took so much longer, there were roots and mud everywhere, we kept slipping, and my knees were inexplicably hurting.” But they persisted and exhausted, reached the summit at 3pm. However the decent turned out to be just as exhausting as the ascent. At the km19 camp they knew that if they had left their things there they would have stayed there to sleep. “None of us had any energy. We also miscalculated how much food to bring so we were hungry. I had brought spare batteries but no flash light. I was very prepared, with my spare batteries.” Oscar laughs. It seemed to me the group dynamic would have been instrumental in attempting and completing this challenge and Oscar agrees. Dan, he said, was like the “energiser bunny, bouncing around everywhere” and Adam, well Adam clearly wasn’t himself and in a way Adam’s difficulty had given Oscar more confidence in his own ability. This brings up a key question for me, what the point of this trip is, and Oscar too realises he doesn’t have a confident sound bite for his motivations, “There is a ‘why’ but I am not sure what it is yet.” We both decide that maybe the point becomes apparent in the doing. Oscar too would like to find a way to make money from these adventures that he loves, and this expedition may be the testing ground for whether there is a way to be a full-time adventurer. We discuss sponsorship but unsurprisingly it’s hard to secure a good deal especially when you don’t yet have a track history. That said, Oscar has set up a blog OscarsAdventures.com in which he’s writing about the journey. Finally still aware of his isolation, I ask about how his family and friends have responded to his adventure. 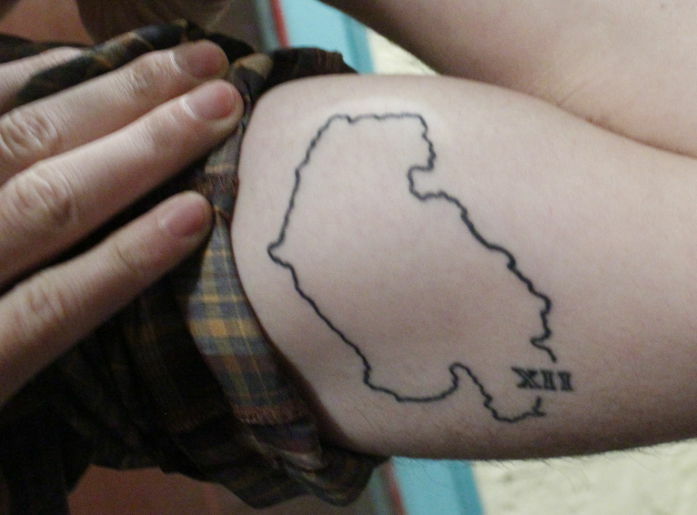 The tattoo includes the numerals ‘XII’ at the start of the loop signifying the decisive moment to ‘rise to the challenge’ at km12 on the Victoria Peak hike. This story would be remiss without adding that when Oscar left for the start of the loop in early March, it wasn’t the last I’d see of him. I’d followed his blog and noticed he had been experiencing difficulties on the Enchantment Trail, the beginning of the loop from New Mexico to Arizona. It had been freezing at night and his hikes had become plagued by joint pain and loneliness. A great illustration of this is in his post Imaginary friends, where he follows in the footstep of another unseen hiker, deconstructing the other man’s journey and physical condition by the location and depth of his footprints in the snow. Two weeks after bidding Oscar a fond farewell, as I walked through the hostel a familiar voice said “Hello again!” It took me a few seconds to fully realise here was Oscar again, back in sunny Albuquerque. Not at all where I was expecting him to be. He told me in summary “I was losing motivation because I was alone and I felt unprepared for the cold nights.” Also, although his plans were loose, his own daily milage expectations had become a cruel mistress. He realised he just wasn’t enjoying the walking anymore. So, he decided to re-route himself to begin the hike (again) from Mexico at the Southern most most point of the Pacific Crest Trail. Here he would have more company and more clement weather that would allow his body to adjust to the daily demands. 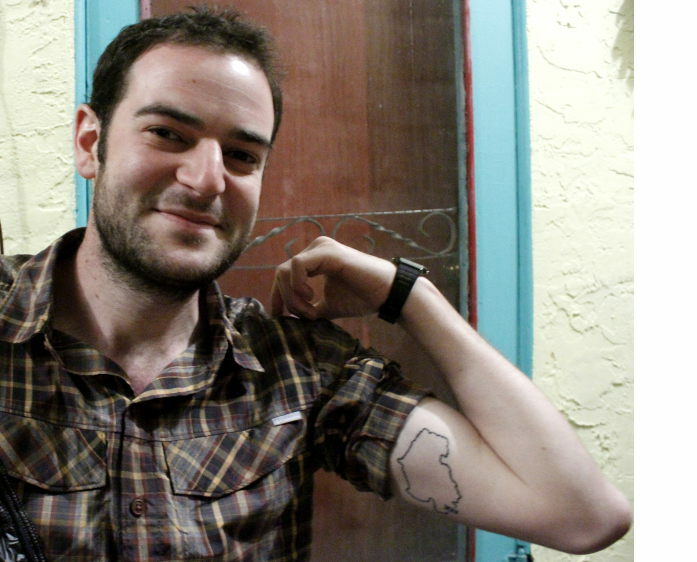 In his blog post Bumps in the road, he noticed that “commitment as a strategy” such as having a tattoo of the route, wasn’t enough to get him through. To me, this early set-back was actually a set-forward for Oscar. He is learning valuable lessons about himself, about motivation and about his own unique needs physically and mentally. Seeing what isn’t working, changing plans but still going on is how he’s chosen to tackle this, and that in itself is inspirational to me. As of writing, I can see he’s doing well. His his geo-locator map shows he camped last night Northeast of Los Angeles at Silverwood Lake, a reservoir in San Bernardino County. I’m still not sure why he’s doing it (neither apparently is he) but it’s a pleasure to share this journey with him through his writings, and especially to see what new mountains internal and external will challenge him next. 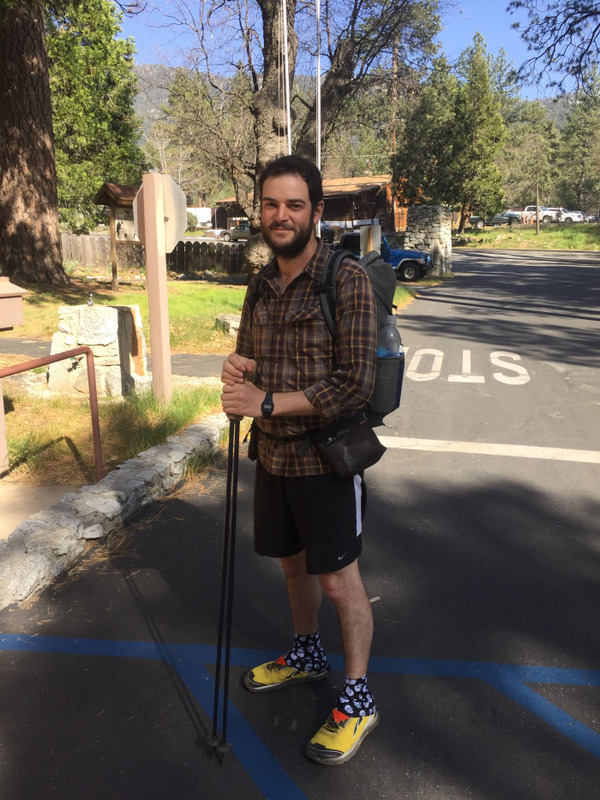 A recent picture of Oscar in California, with his carbon fiber hiking sticks.